COMPLETE CPA EXAM COURSE Prepare for CPA Exam Success. ALWAYS CURRENT WITH FREE ONLINE UPDATES UNTIL YOU PASS. Pass the CPA exam with a course that helps you make better decisions as you study. Real-time analytics, advanced study tools, and expertly-authored materials make this the only course you need for the most important exam of your career. Become a highly efficient learning machine with the side-by-side design of our platform. All of your learning resources are connected and accessible with a simple click. The information you need is always within reach, so you spend less time searching and more time studying. As you study, we track your performance level and confidence in each topic, showing you where to invest your time. No other course is this precise. 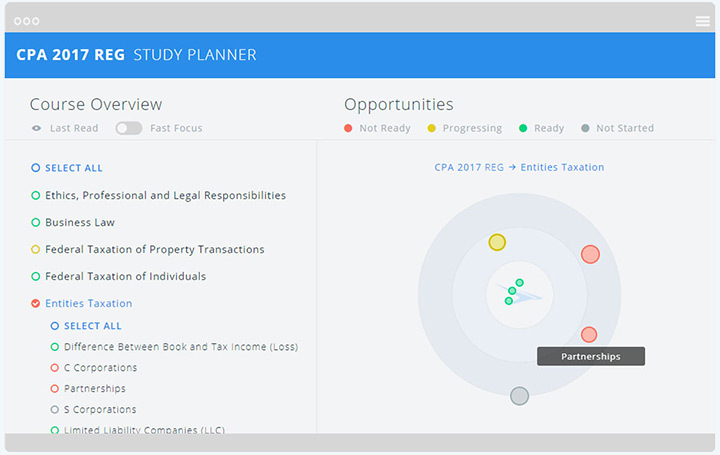 Combined with CPA practice exams that are timed and structured like the real thing, you’ll know exactly when you’re ready to pass. Connect with your instructors and fellow students in the Community and get help with difficult CPA exam topics. Whether you’re reading your textbook, watching a lecture, or practicing study questions, we bring the conversation right to you. We won’t insult your intelligence with unreliable pass rates or twisted statistics. We certainly won’t make payments to shady review sites to rank us as “2018s Best CPA Review Course.” Marketing gimmicks and fake reviews won’t help you pass. You deserve the highest quality instruction, the most advanced technology, and the absolute best support until you pass all of your exams. Give us the opportunity and we will exceed your expectations. 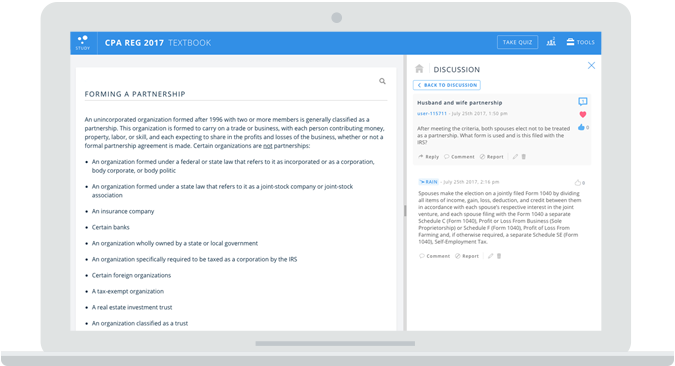 Split View Experience Access all of your learning material quickly and efficiently with the side-by-side design of our platform. FastFocus Create the perfect final review. With just a click, you can condense the entire course to just your weakest areas. Taking Notes is Finally Simple We designed our online textbooks so it’s incredibly easy to highlight important information, take notes, and organize them by color. Digital Flashcard Creator Boost memorization and study more effectively. Turn your notes into a personalized deck of flashcards that you can drill on any device. Integrated Authoritative Literature Authoritative literature is accessible right from your study tools, so you won't have to waste time searching for it. Excel Spreadsheet We give you a fully-functional Excel spreadsheet that makes complicated calculations a breeze. Video Lecture Player & Slides Our custom-built video player allows you to skip to important sections while the corresponding slides ensure you don't miss any of the key points. Take notes and create discussions while you watch. 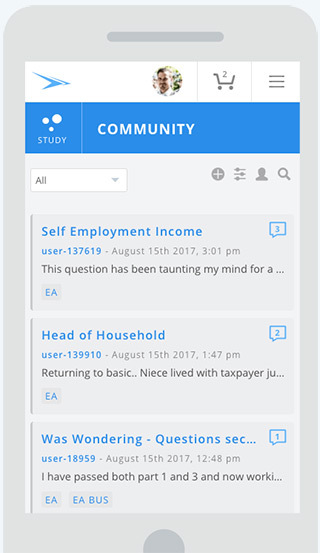 Online Community Connect with subject-matter experts and fellow students from anywhere in the course and get the help you need, when you need it. History Detailed reports show your performance and confidence level in each topic so you can prioritize your study time. Access Anytime, Anywhere The course is desktop, tablet, and mobile friendly, so you can study from anywhere with just your web browser. GET STARTED TODAY WITH OUR 30-DAY MONEY BACK GUARANTEE. What makes this the best CPA review course for me? Instead of forcing you to study a certain way, we give you real-time analytics and powerful tools to help you make smarter decisions as you study. Expertly-authored material, engaging video lectures, and a one-of-a-kind online Community give you the freedom to study how you learn best. How do your CPA exam review lectures work? 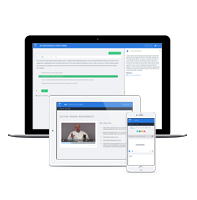 Access over 80+ hours of engaging video lectures with over 470 concise lessons. We break down the important topics that you need to know with 5-20 minute lessons which use real-world examples to explain difficult CPA exam topics. What type of review questions does the CPA exam course include? Can I filter my CPA review questions to focus on specific sections? How are updates delivered to my CPA exam prep? As new content becomes eligible for testing on the CPA exam, we will update your online CPA review automatically and at no extra cost to you. We guarantee course access and updates until you pass. Do I have a limited time to study with my CPA prep course? No. We believe that CPA prep should be there for you when you need it. For this reason, we include course access and updates until you pass your CPA exam. What is the value of the CPA license? Passing the CPA exam isn’t required to become an accountant. However, those that are able to pass their exams within 18 months and become licensed will surely reap the benefits. Increased credibility comes with nationwide recognition for the CPA designation and according to the AIPCA, CPAs earn 15% more on average than non-CPAs in similar roles. Ready to begin? View our CPA Exam Application Guide. What is the average study time for the CPA exam? The average CPA exam prep time is roughly 100-120 hours per part. There are four parts, AUD, BEC, FAR, and REG. After passing the first section, CPA candidates have 18 months to finish their exams before having to retake a part. Which should you take first? Here are the most common CPA exam strategies. CPA exam requirements vary by state. Some states like California require 150 hours to test whereas states like Florida allow you to test with just 120 hours of education. You do not have to test where you wish to be licensed, but you will need to meet the licensure requirements for that state if you want to call yourself a CPA. View your state’s CPA exam requirements. CPA prep courses love to talk about pass rates. You’ll often see review courses touting pass rates of 80% or higher. What does the real exam pass rate look like? Well, it’s less than 50%. The online CPA exam course leverages patented technology to help you pass all four CPA exams. 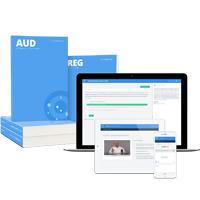 The course helps you learn more efficiently, utilizing an intelligent online textbook, thousands of CPA review questions, and unlimited practice exams with subject analysis and advanced reporting. This complete course for all four CPA exams includes the paperback edition of the CPA textbooks plus access to all of the questions and advanced technology of our online CPA exam course. This course helps you focus on the right topics with clear recommendations on where to invest your study time. Sign up to receive updates, study tips, and special offers from Fast Forward Academy.